SustainableWork: Congratulations Innovation Kitchen partners Karen and John! Wisconsin's 2011 'Rising Star' Award winners. Congratulations Innovation Kitchen partners Karen and John! Wisconsin's 2011 'Rising Star' Award winners. 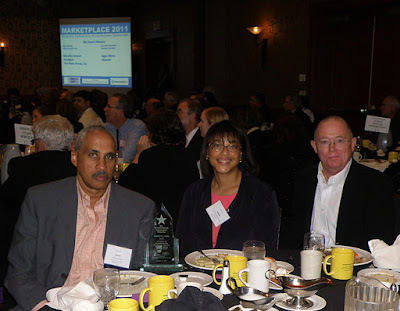 Last week our Innovation Kitchen partners Karen and John were awarded Wisconsin's Minority Business Enterprise 'Rising Star' Award for 2011. Karen and John utilized the Innovation Kitchen to launch their own private label food business. No matter where you live, you can too. They own a beautiful B&B in Elkhorn, WI and have their amazing recipes prepared, packaged and private labeled for them at the Innovation Kitchen. The fact that they are helping make great jobs for my friends with disabilities through the Hodan Center in Mineral Point is a great bonus for all involved. Thank you for the opportunity to help launch your wonderful commercial food business through the Wisconsin Innovation Kitchen. Photo from Marketplace 2011. Wisconsin Governor's Conference on Minority Business Development - Congrats Karen and John!